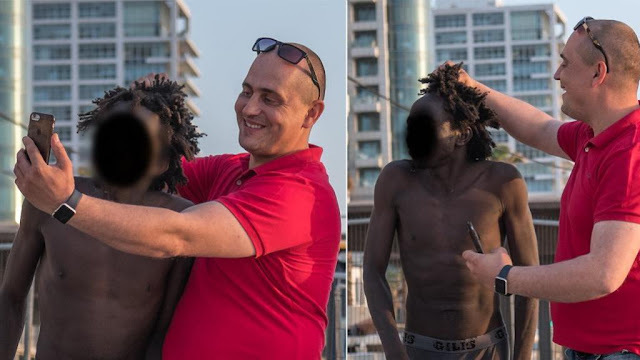 Photos taken went viral in social media when a white man in Tel Aviv, Israel grabbed a black man's hair and manhandled while taking selfie for both of them. The black man came to grinned while posing for a pic but the other black man surprisingly is laughing while the slight known violence known to the netizens is happening in minutes of this incident. Jonathan Small the photographer showed pictures even look like black men been intimidated by joke and laugh along. Some trools even captioned pictures “Israelis treat people of colour”. The photos were shared over 3,400 times in Facebook and more than 6,000 times in Tweeter.